A health food restaurant that's not fully protecting public health. Co-owner Tino Gomez knew what was up the moment we walked in the door at Juicy Beets near Paradise Road and Twain Avenue. LAS VEGAS (KTNV) — A health food restaurant that's not fully protecting public health. Don't dine until Darcy Spears drops a dime on Dirty Dining. Tino Gomez knew what was up the moment we walked in the door at Juicy Beets near Paradise Road and Twain Avenue. "I actually see you guys all the time," he said to Chief Investigator Darcy Spears. "So you've seen Dirty Dining and you know what it's all about?" Spears asked. "Yes, exactly. You guys are doing an amazing job, actually, by bringing this information out. And so, like, I'm not embarrassed to be part of it. I mean, it's just something that happens. And so I think that it's definitely a great way to learn." Gomez co-owns the vegan restaurant that's been operating with a 39-demerit C grade since its Nov. 13 inspection. He says he counts on my reports as both an owner and an eater. "This is what kind of keeps a certain standard out there, especially in the restaurants. And as a patron as well you feel a little more comfy actually dining in a place that is doing what they're supposed to be doing." He and his partner have only been in the restaurant business for about five months. "I wish there was like a manual that you can go through which would be super simple, but it's not. These are the mistakes that we make when we just open up a restaurant and so those are completely honest mistakes that we did. And so, like, we learn a lot from it, obviously. That was an amazing wake-up call and so now it's just things to implement." Things like better handwashing and food storage procedures after inspectors found tofu, rice and quinoa at unsafe temperatures, a pan making direct contact with condiments and a spoon handle lying in guacamole. "They said that there was food that was expired or held past its 7-day shelf life and they listed a number of things including pho broth, Pub Fire soy-based filling, roasted garlic cloves, rice that was more than two weeks old," Spears said, reading off the health inspection. "Yeah, actually that was some of the stuff that were left inside the walk-in behind other containers," Gomez replied. "It wasn't anything that was actually served to customers or anything like that." Inspectors also found dirty floors, walls and ceilings and heavy mold in the ice machine making direct contact with the ice. "They were super helpful with us," Gomez said about the Health District. "They told us a lot of amazing pointers, a lot of things that we can definitely improve on." Gomez attributes many of Juicy Beets' violations to training a new staff. Inspectors found a cart of glasses and dishes stored under the fly zapper, two employee cell phones on the prep table and a pair of sunglasses stored on a clean dish rack. 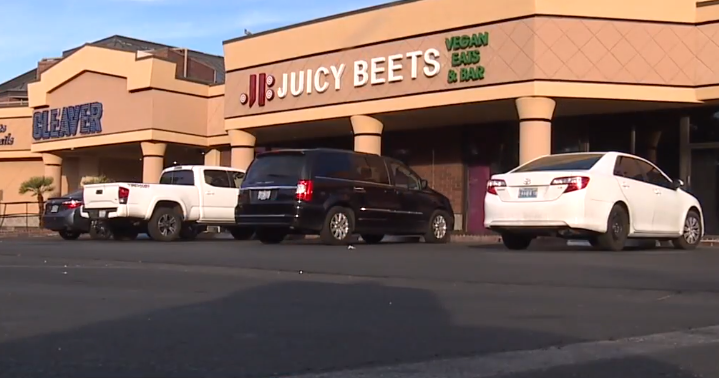 Juicy Beets has its re-inspection scheduled for Dec. 3 when they expect to get their A grade back.